Are we the only ones out there who go through each new Williams-Sonoma catalog like it was a cooking magazine? We often find recipe ideas in it or links to them on their website. This cassoulet is one of those. 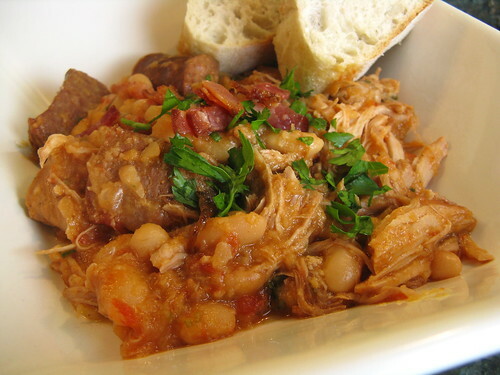 A cassoulet is rustic stew of white beans & meat that have been slow cooked. It seems like the crock pot is the perfect cooking tool for this dish. The recipe from Williams-Sonoma is adapted from one by Thomas Keller of The French Laundry so I figure it had to be good. It is a bit of a modern take on the French classic with its use of Spanish chorizo & Japanese panko. I cut the recipe in about half (sort of) & that filled my whole crock pot which is a pretty big one, I can't imagine how big a pot you'd have to have for the full dish! I stuck pretty close to the original recipe though I had to change the cut of pork since my butcher was out of pork shoulders. I also left out a step at the end where you broil the cassoulet with slices of baguette on top & just served it with some bread on the side. It took about 1/2 hour of prep work to get everything ready for the crock pot, then 7 hours of cooking & then 30 minutes of standing time so plan accordingly (I started it around 10:30 am & we ate at 6:30 pm) also the beans need to soak overnight. The day before making the cassoulet pick over your beans & put them in water to soak for 24 hours. Drain & set aside. In a large skillet over medium-high heat cook the bacon until crisp. Remove from the pan & drain on a paper towel, leave the bacon fat in the pan. Set the bacon aside until later. Generously salt & pepper the pork. Put into the hot skillet & cook until brown on all sides, 7 to 8 minutes. Remove & set aside. Add the onion & a little salt to the pan. Cook until the onion & starting to brown & soft, about 7 minutes. Add the white wine to deglaze the pan. Let the wine & onions simmer until reduced by half, about 8 minutes. Put the wine & onions into the crock pot. Stir in the tomatoes, tomato paste & chicken broth. Add the pork, sausage & garlic. Set the crock pot to low & cook for about 7 hours, the beans should be tender & the pork should easily fall apart (I checked mine after 5 hours & felt it wasn't cooking fast enough so I turned it up to high for the last two hours which did the trick). Heat the canola oil in a small skillet over medium-high heat. Add the panko & cook while stirring until golden brown. Season with salt & pepper. Gently fold the panko & parsley into the crock pot. Turn the crock pot off & let sit at room temperature for 30 minutes. Serve garnished with more parsley & the crispy bacon. Would we make this again? Yes, its a warm, comforting stick-to-your-ribs dish. The pork was so tender is just feel into pieces throughout the whole dish. 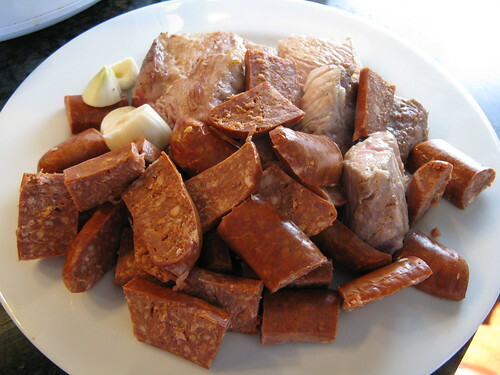 The only thing we would change is the chorizo, it doesn't seem quite the right sausage & its flavor really stuck out, next time we'll experiment with a different one. Looks delic - a really popular dish here in France, but one which I haven't made yet. 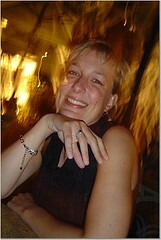 I do have a couple of recipes 2 test out, and feel quite inspired now - thank you! Hmmm... I think I need to sign up to get the Williams Sonoma catalog. When I made a crock pot cassoulet I used Hillshire farms brand kielbasa (the kind that is in the refrigerated section next to the luncheon meat). I though it worked quite well as it has a sausage flavor but didn't overpower the whole dish. I could see the chorizo being too strong a flavor for everything else. I don't own a crockpot and have never wanted one! This recipe may make me go out and buy one! My fave winter dish! yes I always get the catalogs, and safe the recipes. They are pretty good too. Cassoulet must be popular these days! Cooking Light magazine had a recent article about how to cook a cassoulet. I'm motivated to try. You always beat me to the WS catalog :) I think it's lying around somewhere in our house. This is a nice shortcut cassoulet recipe. I can imagine what you mean about the chorizo, and would also switch to more of a european sausage. I always make this kind of dish in my dutch oven (don't actually own a slow cooker). So glad you used dried, not canned, beans! Did you not cook the sausages at all before cutting and adding? I keep asking for the WS catalog, but somehow, it never makes it to my house... This does sound delicious! Nice warming dinner. Great that you can make it in the crockpot. As much as I love chorizo in bean stews, I can see what you mean about it not being right in this one. It's hard to beat a classic Toulouse sausage for cassoulet. It's mucho-freezing up here and the cassoulet would hit the spot. The Chorizo would make this super delish. chorizo in a tradional french dish.. very interesting, william sonoma! an interesting twist to a classic. we just made cassoulet the long, painstaking stove-top way last weekend - it took about 6 hours total. we're still tired from making it but it was so rich and delicious. i don't know if i could eat it one more day, though after the leftovers! the crockpot would def. make this an easier meal. Whoa that looks so good. I love WIlliams Sonoma magazine... I mean, catalogue. Finding a recipe in there is like getting a treat. It is one of my favorite sites to look for recipes but it has been a while. Since I feel as if Minnesota is in its eighth month of winter, this definitely will be made. And I read Williams-Sonoma for the recipes. Thought everyone did! What a nice multicultural cassoulet. Love this stuff. I tend to use Aidell's in my cassoulet... doesn't overwhelm the whole thing. I just found your site today. I searched for crock pot cassoulet. My meats were lean pork roast and regular kielbasa. I ended up putting potato in, because the kielbasa was saltier than i liked. I had searched for Basque and Cassoulet recipes this morning. Your recipe was the MOST inspiring! I made this last night and OMG! It was to die for! I did change a few things: I used Basil/Garlic sausage links (Italian style) and since I could not find a 14oz can of plum tomatoes ANYWHERE, I just used the larger sized can and it was fine. I also used a whole pkg of Great Northern Beans and that was just fine, too.